SOLD OUT!The first issue on Monster Bash magazine. What is the classic monster movie conference is now a classic monster magazine. CLICK IMAGE FOR DETAILS. The big Creature issue....low on stock! CLICK IMAGE FOR DETAILS. A howling fun issue! CLICK IMAGE FOR DETAILS. KING KONG's favorite issue of Monster Bash. CLICK IMAGE FOR DETAILS. It's....THE BRIDE OF FRANKENSTEIN. This issue is packed with photos. CLICK IMAGE FOR DETAILS. From the depths of the earth come THE MOLE PEOPLE all all your favorite monsters. Glossy magazine. CLICK IMAGE FOR DETAILS. The Mummy Lives! Plus, more of the classic fiends in the pages of Monster Bash Magazine. CLICK IMAGE FOR DETAILS. Bela Lugosi alive again in Monster Bash Magazine. Interviews and loads of photos. CLICK IMAGE FOR DETAILS. Big Wolf Man issue with photoplay of rare and favorite photos from THE WOLF MAN (1941). Forry Ackerman, THE WITCH'S DUNGEON, Visaria, 13 DEMON STREET, Lon Chaney Sr., Tor Johnson. CLICK IMAGE FOR DETAILS. The classic monster magazine that is kid friendly! Bring back all your favorite monster movie memories in this issue with King Karloff, Lon Chaney Sr., Dear Ygor - Michael Thomas. CLICK IMAGE FOR MORE. The magazine of classic monster movie fun! Join writers Tom Weaver, Michael Lederman, Lawrence Fultz, Ron Adams, and more as we find out about TEENAGE ZOMBIES, A Gorilla Dad, Dinosaurs of the Silver Scream, The Niagara Falls Frankenstein, and more! In this issue a journey to the ISLAND OF LOST SOULS with author Frank Dello Stritto, Deep in THE BLACK SLEEP, Piecing Together Frankenstein, Halloween Monster Memories, THE HIDEOUS SUN DEMON, Buster Crabbe's other job Favorite All-Time Monsters of the Movies! Creature Cool Creepy Issue! Dive deep into the lagoon with the Gill-Man, See Lon Chaney Jr's Gallery of Ghouls, Monsters We Grew Up With, Dinosaurs Are For Kids, Vincent Priceless. Beautiful cover painting by the Renaissance woman of the monster world - Lorraine Bush. Find out about actor Richard Dix's involvement in Universal's THE MOLE PEOPLE, working with Al Adamson and hanging with Robby the Robot in FORBIDDEN PLANET. FRANKENSTEIN as part of 77 HORROR, the syndicated TV package. Julie Adams speaks from the Lagoon. CLICK IMAGE FOR MORE. The LONDON AFTER MIDNIGHT issue! Lon Chaney's classic 1927 "vampire film." The history, the speculation, the facts...unearthed and sewn together by Kevin Slick. Also, DRACULA'S END,Memories of FLASH GORDON, the great films of Lon Chaney Jr. Best issue ever! Click image for more! This issue is jammed full of great articles, interviews: Peggy Moran of THE MUMMY'S HAND, super rare photos, Hammer. Authors like Tom Weaver with a feature on CURUCU, BEAST OF THE AMAZON, Bruce Tinkel's ALLIGATOR PEOPLE, The "Things That Really Scare You" and more gruesome goodies. Great articles. Inside Deepest ZACHERLEY by Rich Scravani, Bob Burns and Tom Weaver blast back to Mars for IT! THE TERROR FROM BEYOND SPACE, Ed Wood's PLAN 9, SON OF DRACULA, Reflections of vampires by Frank Dello Stritto! Don't dare miss IT, or IT will travel from beyond space to find YOU! The retro monster mag full of great information and fun! See the Many Hunchbacks of Notre Dame from Lon Chaney to Anthony Quinn by Kevin Slick, THE RETURN OF THE CREATURE surfaces - the lost film discovered by Tom Weaver, Werewolves and Vampires by Frank Dello Stritto, Gruesome Galleries and more! Best issue ever! THE GHOST OF FRANKENSTEIN with Lon Chaney, Jr. remembered. Lon Chaney, Sr. - Man of 1000 Make-Ups, TOBOR THE GREAT, Amazing Colossal Creatures, The Gemora Gorilla, Scholastic Books...Writers include Tom Weaver, Bob Burns, Frank Dello Stritto. Cover by Lorraine Bush. In this fear-packed issue: 83 Years of Lugosi's DRACULA, Was Bela Lugosi Really Hypnotized For BLACK FRIDAY?, This Island Morrow - The Jeff Morrow Story, The Ghost and Mr. Knotts and more! Authors Tom Weaver, Frank Dello Stritto, Kevin Slick, Leonard Hayhurst. Cover art: Lorraine Bush. Travel to a small community where the gas station attendant is a witch doctor in VOODOO MAN, THE AURORA MONSTER MODELS through a kid's perspective, THIS ISLAND EARTH and more. Articles by Tom Weaver, Frank Dello Stritto, Steven Thornton, Ron Adams and more! Cover art: Lorraine Bush. Scary amusement park rides remembered, a kaleidoscope of Carradine....John Carradine film favorites, I MARRIED A ZOMBIE FROM POVERTY ROW, the missing scenes from GHOST OF FRANKENSTEIN?, John Carradine's TEN movies of horror for the love of Shakespeare and more! Cover by Lorraine Bush! Inside this fear-film packed celebration: Fans Speak Out - Their CREATURE FEATURES and monster movie fan origins, 50 Years in The Witch's Dungeon, THE BLOB's Jack Harris interview, Quicksand monster movies, DVD and Blu-Ray new releases and much more! THE WOLF MAN cover painting by Lorraine Bush. BRIDE OF FRANKENSTEIN historical overview, Colin Clive's Films, GODZILLA VS. GOJIRA - A Look at Original Japanese Releases and Their US Versions, Tod Browning's Trick-Or-Treat - Bela Lugosi's Count Mora and more. Writers include Greg Mank, Frank Dello Stritto, cover by Daniel Horne. Spotlighting the early year's, Bela Lugosi as DRACULA! 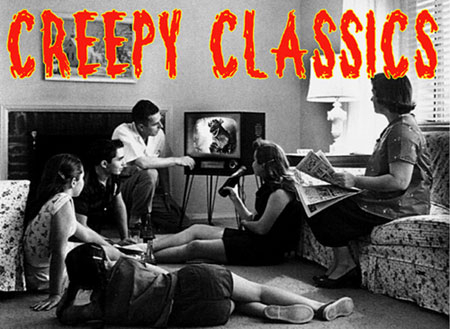 Plus, zombies or just plain ol' ghouls in the original NIGHT OF THE LIVING DEAD. Early cable TV Hosts: Grampa, Commander USA and Phantom of the Opry. Ginger Stanley from the Black Lagoon. FRANKENSTEIN MEETS THE WOLF MAN and more! It's all about Christopher Lee, his movies and.....Dracula! Photos of the films, Chris Lee Filmography, the MONSTER BASH Christopher Lee Interview, Memories of Christopher Lee by Hammer actresses Veronica Carlson, Caroline Munro and Yvonne Monlaur. Plus, memories by you and much, much, much more! A tribute to the world's best known TV Horror Host, Zacherley! Plus, the Gruesome Gallery, Classic new DVD and Blu-Ray Reviews, Famous Falling Stars. The classic monster magazine for a Monster Boomer Generation. Contributions by Tom Weaver, Rich Scrivani, George Chastain, Kevin Clement and more! Dedicated the greatest horror-comedy film of all-time: ABBOTT AND COSTELLO MEET FRANKENSTEIN. 70 Year Anniversary! All star writers: Tom Weaver, Greg Mank, Frank Dello Stritto, Don Smeraldi, Dennis Druktenis and more. Background, history, rare photos, love for this classic movie. It's one last chance to get ten issues of MONSTER BASH magazine at one low price. We can't offer this much longer as issues as #2 is almost totally gone. Take advantage now to get all ten issues (MONSTER BASH #2-11).